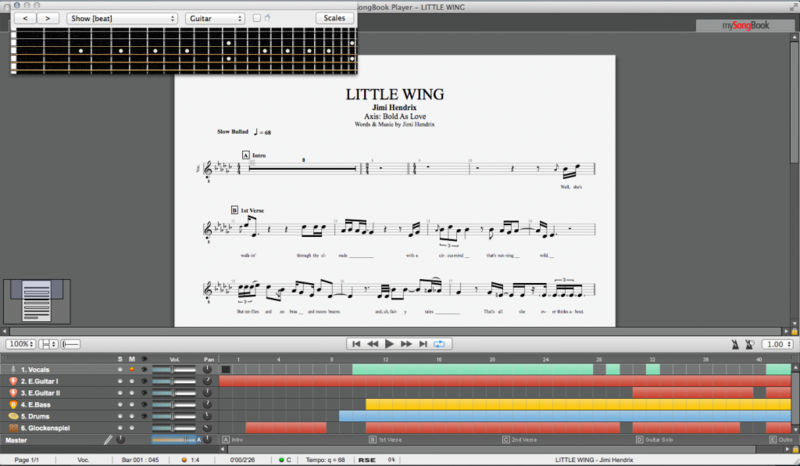 Cooked up by Arobas Music, known for the ubiquitous GuitarPro tab software, here is mySongBook, a software program and an Internet score/tab service rolled into one. 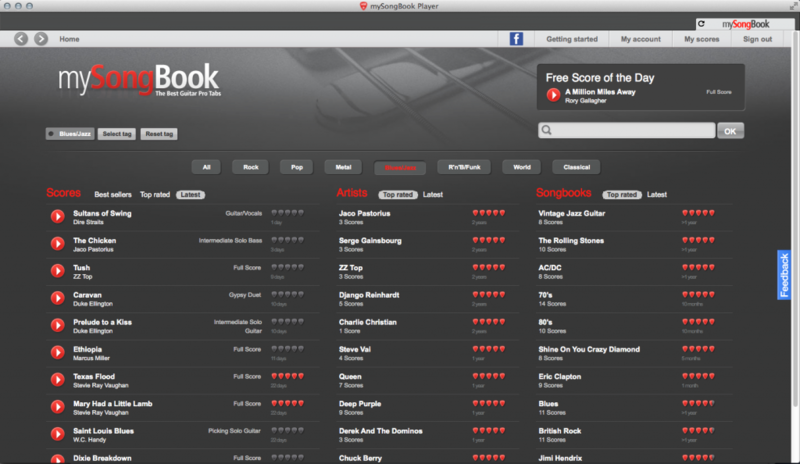 The first thing to do to use it is to sign up on mysongbook.com and download the software (for free). It is available for Windows, Mac and Linux. The software allows you to browse an extensive collection of scores and tabs, each available for a small fee: from Eur/USD 0.99 for a guitar only partition to Eur/USD 1.99 or 2.99 for a multitrack arrangement. The currency depends on your country of residence. Note that these tabs are made by professional musicians that Arobas music comission so, in theory, these are pretty high quality. You are not paying for tabs that Joe Bloke transcribed 15 years ago and that are normally available for free. Talking about free, there is a ‘free tab of the day’ that you can download by clicking in the upper right hand corner of the welcome screen. There are also song books, a collection of tabs/scores of the same artist that you can buy for a reduced price. For instance, the AC/DC song book contains 8 songs and can be downloaded for Euros/USD 9.99. Compared to buying individual songs, songbooks offer discounts going from 20 to 40%. The search function allows you to zero in on a tab quickly but if you feel more like browsing, you can do so by genres (Rock, Pop, Jazz, etc.). The catalog seems to lean heavily on ‘classic rock’ for now but all styles are represented. Last but not least, there is a rating system where customers can give a 1 to 5 star (well, they look more like little guitar picks) to a particular tab. Now you might ask, what do I do with a tab once I have downloaded it? This is where mySongBook borrows heavily from GuitarPro: you can load up your tab/score into a full fledge player that will play all the parts (not only the guitar) while showing you the current position in the tab. Each part can be muted or soloed in order to play along or just isolate the part you are the most interested in. There is a keyboard/guitar neck/drum view that shows you each note on the relevant instrument. So really, this is not only for guitarists. There is also a ‘bass view’ appearing when you click on the bass track. The tempo can be lowered or increased. Lowering it allows for ‘zooming in’ on those fast licks. All the parts are played by a synthesizer so don’t expect the guitars to sound exactly like the original although this is not nearly as bad as I thought it would be. Most guitar specific articulations are rendered pretty well although it sounds a bit mechanical. It is more than enough to get a good idea of the song and learn it. The player has other goodies: display of tho pages of the score on one screen for those with big screens and a metronome. You can also display all instruments on the score instead of having separate scores. Learning an instrument is getting more fun by the minute, I think the integration in mySongBook of the tab/score download service and the GuitarPro like player is excellent. I don’t want to sound like an old fart but I would have loved to have something like ‘mySongBook’ back when I was young and crazy. Granted, there is a lot of free tabs on the net (and I used them heavily in the 90s as I was part of a cover band) but the quality is very variable. Sometimes, you wonder if the transcription is actually for the song it is supposed to be! Compared to actual printed songbooks, mySongBook offers an excellent alternative, the “player” being a big plus. I would encourage you guys to try it as there is some free content and the software itself is free. Happy learning!